In the fifth episode of Ampersand, editor in chief Kevin Larimer and associate editor Melissa Faliveno preview the January/February 2016 Inspiration Issue, featuring essays on the origins of storytelling, historical fiction as an invitation to wonder, the challenges of facing difficult material on the page, and taking risks in creative nonfiction, and our eleventh annual look at the year’s best debut poets; plus writing prompts for the new year, daring to discover your dangerous writing, the art of biography, questioning self-promotion, interviews with Kay Ryan, Saeed Jones, and Michael Schaub, and much more. 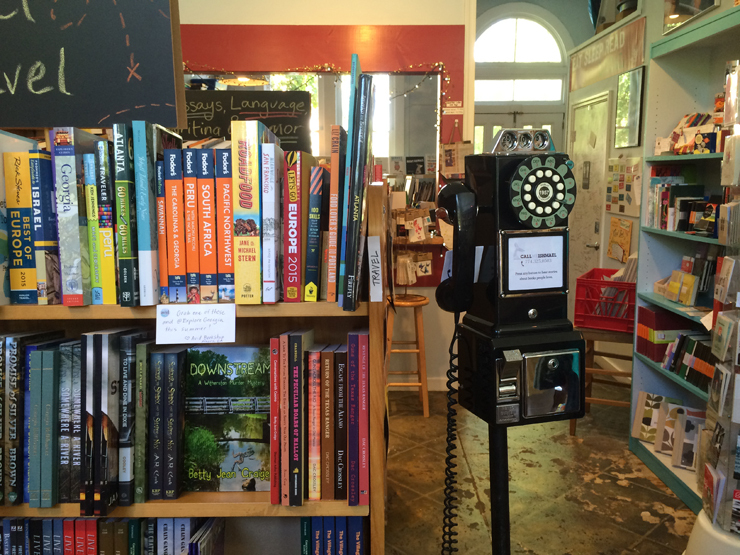 A Call Me Ishmael phone installed in Avid Bookshop in Athens, Georgia. 0:01 A caller leaves a personal message about The Diary of a Young Girl by Anne Frank as part of Call Me Ishmael, a new website and app launched by Logan Smalley and Stephanie Kent that allows readers to share stories about the books that matter the most to them. Read "Calling Ishmael" in the new issue. 2:21 Kevin and Melissa talk about the new issue's cover, designed by Michael Waraksa, including the early drafts of the cover art (below), and the eleventh annual debut poets roundup, "Fractures Through Time" by assistant editor Dana Isokawa, which shines a light on some of the most exciting debut poets of 2015, including Robin Coste Lewis, Ricky Laurentis, and Morgan Parker, and seven other "poet oracles." The editors listen to another caller tell Ishmael about his childhood memories of reading The Sneetches by Dr. Seuss. 10:36 Contributor Cat Richardson has lunch with Saeed Jones, the executive editor of culture at BuzzFeed, in a bustling Manhattan eatery. The two talk about the impetus of the newly launched BuzzFeed Emerging Writers Fellowship, which Jones helped established last year. The annual four-month fellowship program will provide four writers with a twelve-thousand-dollar stipend and mentorship from the media company's editorial staff. They also discuss diversity in publishing and the need to "put your money where your mouth is" in order to truly make a difference. Read "Saeed Jones Feeds the Buzz" in the new issue. 15:13 Morgan Parker, one of the debut poets featured in the new issue, reads two poems from her collection, Other People's Comfort Keeps Me Up at Night, winner of the Gatewood Prize and published by Switchback Books. 17:43 Kevin and Melissa look back at Poets & Writers Live in Portland, Oregon, where a star-studded lineup of authors and editors, including Michael Wiegers, Debra Gwartney, Justin Taylor, Matthew Dickman, Rhonda Hughes, Leni Zumas, Elena Passarello, and Tom Spanbauer came together for a program focused on Independent Publishing. The day-long event was kicked off by a keynote from Barry Lopez, which is excerpted in the new issue of the magazine. 26:48 Next stop: Austin, Texas. The editors look forward to the next Poets & Writers Live event, which will be held on January 9 at Austin's Blanton Museum of Art. The theme of the event—no coincidence—is Inspiration, and the lineup includes Elizabeth McCracken, Naomi Shihab Nye, Ben Fountain, Saeed Jones, Benjamin Percy, Matthew Gavin Frank, Carrie Fountain, Edward Carey, Kirk Lynn, and many others. Kevin, who will be moderating the Perfect Pitch Panel, is looking for a refrigerator box (long story). Tickets are on sale now! Ampersand: The Poets & Writers Podcast is a production of Poets & Writers, Inc., and is edited by Melissa Faliveno with assistance from Jonathan Walsh. Music and recordings for this episode are provided by Call Me Ishmael, Podington Bear, Tyrannic Toy, Chris Zabriskie, and the Crevulators. Comments or suggestions? E-mail editor@pw.org. Caroline Davidson, the editorial assistant of Poets & Writers Magazine, records the podcast's ending credits. Award-winning author Barry Lopez delivers the keynote address at Poets & Writers Live at the Pacific Northwest College of Art in Portland, Oregon, on October 17, 2015. With an app, a website, and a fleet of rotary-style pay phones, the new interactive project Call Me Ishmael allows readers and book lovers to call the fabled sailor and leave him personal messages about their favorite books.